With beautiful lakes, a mighty river, flocks of families on motorcycles, noisy horns and nostalgia, Hanoi, the city on a bend of the Red River, has long been Vietnam's artistic and cultural heart, as well as being the country's political center. My son and I took a flight from Osaka to Noi Bai airport in Hanoi via Ho Chi Minh City. "Welcome to Hanoi!" Ms. Huong, a slender, dark-haired young lady, met us at the airport. She is an interpreter in Japanese and acts as a guide. We weaved in and out of heavy traffic in Hanoi. People sometimes ride double on motorbikes in Japan. But in Vietnam, motorbikes can hold four or five people. What a sight! We finally arrived at the hotel in central Hanoi. I made traveling arrangements with her. The schedule for on the first day was as follows: Ho Chi Minh's Mausoleum, Dong Xuan Market, Bat Trang Village (that is famous for ceramic arts), and the Thang Long Water Puppet Theatre. I said to her, "I want to go to the Dien Bien Elementary School (the DBES) in Thanh Hoa Province on the second day." She said,"Thanh Hoa? That is very far from here. It's 170 kilometers to the south of Hanoi. I am worried about whether I can understand their dialect." With the help of the Japanese Vietnamese Friendship Society, the DBES was built. I said to her, " And, I want to take pictures of spiders in Vietnam." I drew a picture of a spider. "What is the Vietnamese word for 'spider'?" "It's 'nhen'." A wonderful scene was provided for us on the way from Hanoi to Dien Bien City in Thanh Hoa Province. Conical hats were emerging from green rice paddies. Plain houses stood here and there. And, people live a simple life in Vietnam. We arrived at the DBES in about three hours. My son and I received a hearty welcome at the DBES and I collected several nhen from around the DBES. By the way, I had a bit of good luck. You'll never believe it; I found a large blue spider in Hanoi. The spider was "as large as a pot-bellied pig" and "the threads were thick enough to knit a sweater." It was better than the special effects in Spiderman, the movie. 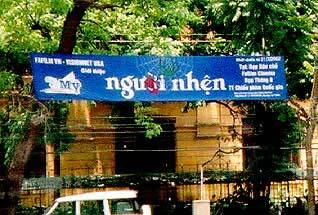 A 'nguoi' is the word that means a 'man' in Vietnamese. So the sign reads "Spiderman".